Objective: The objective of this study is to investigate the effect of ethanol-soaked gelatin sponge (ESG) in the treatment of hepatic arterioportal shunt (APS). Methods: Hepatocellular carcinoma (HCC) patients with APS were divided into experimental group (Group E) and control group (Group C). Patients in Group E were treated with ESG for APS embolization, whereas patients in Group C were treated with polyvinyl alcohol particles for APS embolization, with other treatment unchanged. APS and the Eastern Cooperative Oncology Group (ECOG) physical status scores of patients before and after the first treatment and further consultation in the 6th week and the survival rate in follow-up visit were recorded. The changes of liver function during treatment were monitored. Results: Before the first treatment, there was no statistical significant difference in APS between two groups. After that, APS in Groups E (P = 2.49 × 10−7) and C (P = 2.10 × 10−4) was improved. In further consultation, APS in Groups E (P = 2.73 × 10−13) and C (P = 2.90 × 10−8) was further improved after examinations and corresponding treatment. After the first treatment and further consultation, APS score was lower in Group E than in Group C, and there were still five patients whose APS score was 2 in Group C. Quality of life in two groups was effectively controlled without getting worse and the ECOG score reduced. Liver function in the two groups did not worsen with the use of liver protective drugs. No deaths occurred in Group E, whereas two patients died in Group C during treatment and follow-up visit. Conclusion: The results show that ESG can effectively reduce APS score and improve the survival rate of HCC patients. Hepatocellular carcinoma (HCC) is one of the world's most common malignant tumors. During disease progression, HCC tends to infiltrate the hepatic portal vein, resulting in direct communication between hepatic artery and portal vein, forming arterioportal shunt (APS). HCC combined with hepatic APS is a common phenomenon in the field of interventional therapy for liver tumors. Moderate and severe APS can aggravate portal hypertension and increase the incidence of complications, such as esophagus varicose rupture, refractory ascites, and hepatic encephalopathy.,, In addition, HCC patients with severe APS are usually not suitable for selective transcatheter arterial chemoembolization (TACE) treatment since lipiodol can flow through the fistula to normal liver tissue resulting in poorer deposition of lipiodol in the tumor tissue and aggravating the normal liver tissue ischemic injury., In this case, embolization of the fistula has become the prerequisite and key step of embolization therapy for tumor treatment. Many materials have been used to embolize APS, such as polyvinyl alcohol (PVA) particles and ethanol-soaked gelatin sponge (ESG). Some authors have made a comparative study about the long-term effectiveness of transcatheter arterial and percutaneous ethanol injection embolization for APS. It is reported that the percutaneous ethanol injection embolization group has a better long-term APS embolization rate and a longer 2-year survival rate. In this study, HCC patients were given ESG and PVA, respectively, to compare and analyze the advantages of ESG in the treatment of APS. Patients with HCC admitted to our hospital from September 2011 to March 2016 participated in this study. All patients with histologically/cytologically or clinically proved HCC were unable to undergo surgical resection or refused to undergo surgical resection and had indications for selective TACE. Liver arterial angiography confirmed the presence of APS. All patients were consistent with the following inclusion and exclusion criteria and agreed to carry out APS embolization and TACE treatment in this study and to participate in the follow-up visit after operation. Undergoing surgical resection or TACE treatment in the early stage but in line with the above conditions. Participants were divided into experimental group (Group E) and control group (Group C). They were treated with different embolization treatment protocols, respectively. All patients signed the informed consent. This research was approved by the ethics committee of the First Affiliated Hospital of Zhengzhou University. After admission, other concomitant diseases before treatment, detailed treatment protocols, and the results before the first TACE operation of patients were recorded in detail. During the first treatment, TACE operation time, the amount of PVA and ESG, the dose of lipiodol and chemotherapeutic agent, the dosage and administration of hepatoprotective drug, albumin and painkiller during and after operation, and side reactions during and after operation were recorded in detail. Patients in the supine position carried out right femoral artery puncture with local anesthesia. 5F catheter sheath was inserted and 5F RH catheter was inserted through the catheter sheath. Arteria coeliaca and proper hepatic artery arteriography were performed to diagnose APS (sequencing arteriography: (a) anatomical arteriography: 5F RH catheter, arteria coeliaca: 4 ml/s, 8 m, and superior mesenteric artery 3 ml/s, 6 ml; (b) indirect portal vein arteriography: superior mesenteric artery: 3 ml/s, 30 ml, and if ectopic right hepatic artery happened, the catheter should be in 2 cm above the distal end of ectopic right hepatic artery opening; and (c), lesion arteriography: common hepatic arterial arteriography 2–5 ml/s, 6 sec, and the corresponding feeding arterial angiography of tumor). 2.7-F coaxial microcatheter (Terumo) to the fistula blood supply branches embolizing close to the fistula (to avoid the nonfistula and tumor branches). Fistula embolization material in Group E was gelatin sponge 350–560 m, 100 mg. The mixing liquids of 20 ml nonionic contrast agent (ioversol 320, Jiangsu Hengrui Medicine Co., Ltd) and 20 ml anhydrous ethanol were injected to microcatheter by 2 ml spiral syringe, and 1 ml syringe was used to extract saline for washing. Injection and washing process were performed under fluoroscopic guidance to prevent reflux. Fistula embolization in Group C was performed by PVA suspending in the contrast medium, and other operations were the same with those in Group E. If the embolization process could not effectively slow the blood flow in the fistula, 560–710 um granule embolization could be used. The total amount of anhydrous ethanol was controlled within 50 ml. If the intubation could be performed in tumor blood supply branch which was not the same branch with the fistula, or if there was tumor blood supply residual after fistula embolization, tumor embolization could be performed first. Embolization materials were lipiodol and epirubicin emulsion. Lipiodol: contrast agent = 2:1. Every 5 ml contrast agent mixed with 40 mg epirubicin. According to the need, 350–560 m gelatin sponge particles could be added. When blood flow slowed or the small branch of portal vein appeared, the embolization stopped. When the angiography showed tumors staining disappeared or disappeared mostly, the operation finished. Further consultation was performed in outpatient service in 6th week after the first treatment. An interventional therapy was performed every 6th weeks (before and after a week) from the beginning of the operation, and the change of the fistula was evaluated by arteriography. If the fistula still existed, the first treatment therapy was performed; if there was no fistula, tumor treatment was carried out. The embolization treatment for fistula was performed with ESG or gelatin sponge according to each group; and for tumor treatment, the appropriate treatment, such as radiofrequency or microwave therapy, biological therapy, or sorafenib, was taken according to the actual needs after the second artery interventional therapy. If catheter displacement occurred, the surgical suture was used to fix the extracorporeal part of the catheter and the catheter sheath, covering with sterile gauze, and the patient was informed to avoid pulling the catheter. For lower-limb thrombosis, legs pressure treatment was needed in the catheter-retained period. If patients suffered from gastrointestinal reactions such as abdominal pain, alanyl-glutamine intravenous infusion could be helpful. Before the interventional therapy, patients were assessed the history of alcohol allergy and were monitored during operation. APS classification was evaluated by selective hepatic arteriography at the 6th week after operation. According to the follow-up visit results, patients' survival time was analyzed. According to the mRECIST standard, an assessment about tumor response was made. Moreover, the quality of patients' life was evaluated on the basis of the ECOG relevant criteria. The related complications during the follow-up visit were observed and recorded [Table 1]. All numerical variables were expressed in the form of mean ± standard deviation. The comparison between groups of numerical variables was made by t-test, and Wilcoxon rank-sum test was used in the comparison before and after treatment of patients within the group. Bilateral tests were used for all of the above hypothesis tests. Statistical results showed the test statistic and the corresponding P values. There was a statistical significant difference at P < 0.05. After screening, a total of 32 patients participated in the research. These patients admitted to our hospital from 2011 to 2016 and were able to make a further consultation regularly, which was helpful to collect the data. Sixteen of the 32 patients underwent embolization with ESG (Group E) and the remaining 16 patients were treated with PVA suspending in contrast medium for fistula embolization (Group C). The incidence of male patients was generally higher than female patients in the two groups (P < 0.05), but there was no significant difference in gender between the two groups (P = 0.68 > 0.05). In addition, there was no significant difference in age, height, weight, and body mass index between the two groups (P > 0.05). 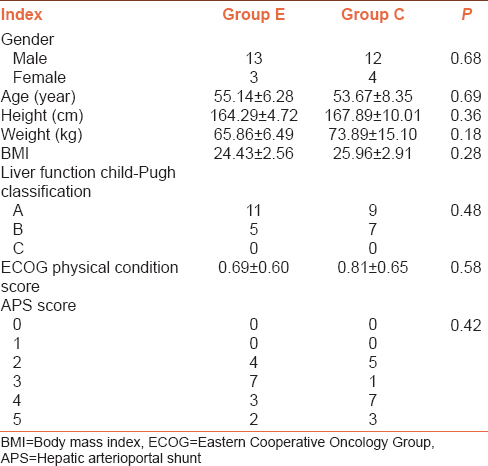 Patients in the two groups on admission had an evaluation about Child–Pugh classification of liver function and ECOG physical status, and there was no statistically significant difference between the two groups (P > 0.05). Selective hepatic arteriography was used to classify APS for patients before treatment, and the results showed that there was no statistically significant difference in APS scores between the two groups (P = 0.42 and P > 0.05) [Table 2]. Selective portal venography was performed to observe APS of patients before and after the first treatment and before and after the 6th week further consultation. APS was significantly improved after treatment in the two groups. However, the improvement of patients in Group E was more obvious. Before the first treatment, there was no statistically significant difference in APS between the two groups. Moreover, after that, APS of patients in Group E (P = 2.49 × 10−7) and Group C (P = 2.10 × 10−4) was significantly improved. Patients underwent examination and corresponding treatment at the further consultation in Group E (P = 2.73 × 10−13) and Group C (P = 2.90 × 10−8) had significantly improved APS compared with the first treatment. After the first and further consultation treatment, APS score in Group E was significantly lower than that in Group C, indicating that patients' situation in Group E improved more significantly. Most patients in Group E had an APS score of 0, while there were still five patients with an APS score of 2 in Group C. Therefore, ESG had a more significant treatment effect [Table 3]. According to the ECOG score in the first treatment and further consultation, quality of life of patients in the two groups was effectively controlled without getting worse. Moreover, after treatment, quality of life of some patients was significantly improved, and the ECOG score decreased. Liver function in the two groups did not worsen with the use of liver protective drugs in the course of treatment. In the course of treatment and follow-up visit, no deaths occurred in Group E, while two patients died in Group C [Table 4]. ESG has significant therapeutic effects for many diseases. Researches have shown that anhydrous ethanol is widely used in embolization of arteriovenous malformation, esophageal varices, and renal carcinoma.,, When anhydrous ethanol is injected into the blood vessel, it can make the blood albuminous degeneration and the vascular endothelial cells dehydration, fragmentation, and precipitation, and the range of efficacy can reach the level of the elastic membrane on the blood vessel wall. ESG embolization for the fistula has more advantages than the simple application of anhydrous ethanol. Anhydrous ethanol has good fluidity, which can penetrate well into the blood capillary and vein of the fistula, damaging adjacent tumor cells. Gelatin sponge can slow the blood flow velocity so that anhydrous ethanol can make a full damage to the blood vessel wall. In addition, gelatin sponge can absorb anhydrous ethanol, prolonging the effect of blocking the fistula. Moreover, gelatin sponge and anhydrous ethanol have the advantages of low price and easy to get. Compared with PVA, ESG has better therapeutic effect, which can effectively improve APS situation. The results in this study showed that APS score was significantly decreased in Group E after treatment and that the improvement in Group E was more significant than in Group C.
APS embolization not only can greatly reduce the incidence of complications but also can make the patients who are not suitable for TACE surgery have the condition of interventional therapy. Patients with improved APS have better survival time. In this study, APS of patients in Group E improved significantly than Group C after treatment, and the mortality rate in Group E was lower than that in Group C.
In addition, ESG can not only embolize APS but also improve clinical efficacy and reduce the fistula recurrence rate and complications related to APS. Moreover, anhydrous ethanol and gelatin sponge have an advantage of low price, which can reduce the economic burden of patients and promote hospital's social influence, bringing good social benefits. This study has received funding by the Medical Science and Technology Project of Henan Province in 2017 (grant number: 201702261). Duan F, Bai Y, Cui L, Li X, Yan J, Zhu H. Transarterial embolization with N-butyl 2-cyanoacrylate for the treatment of arterioportal shunts in patients with hepatocellular carcinoma. J Cancer Res Ther 2017;13:631-5. Zhu LZ, Yang RJ. Digital subtraction angiography manifestation and interventional therapy of arteriovenous shunting in primary hepatocellular carcinoma of advanced stage. Beijing Da Xue Xue Bao Yi Xue Ban 2008;40:129-34. Zhang DY, Weng SQ, Dong L, Shen XZ, Qu XD. Portal hypertension induced by congenital hepatic arterioportal fistula: Report of four clinical cases and review of the literature. World J Gastroenterol 2015;21:2229-35. Tang S, Zeng W, Qin J, He Q, Wu X, Zhou X, et al. Gastric variceal bleeding caused by an arterioportal fistula formation after TIPS and related complications. Dig Dis Sci 2016;61:2442-4. Kawahara Y, Tanaka Y, Isoi N, Hatanaka K, Yamada K, Yamamoto M, et al. Direct intrahepatic portocaval shunt for refractory hepatic hydrothorax: A case report. Acute Med Surg 2017;4:306-10. Sergio A, Cristofori C, Cardin R, Pivetta G, Ragazzi R, Baldan A, et al. Transcatheter arterial chemoembolization (TACE) in hepatocellular carcinoma (HCC): The role of angiogenesis and invasiveness. Am J Gastroenterol 2008;103:914-21. Li X, Feng GS, Zheng CS, Zhuo CK, Liu X. Influence of transarterial chemoembolization on angiogenesis and expression of vascular endothelial growth factor and basic fibroblast growth factor in rat with walker-256 transplanted hepatoma: An experimental study. World J Gastroenterol 2003;9:2445-9.
von Marschall Z, Cramer T, Höcker M, Finkenzeller G, Wiedenmann B, Rosewicz S, et al. Dual mechanism of vascular endothelial growth factor upregulation by hypoxia in human hepatocellular carcinoma. Gut 2001;48:87-96. Furuse J, Iwasaki M, Yoshino M, Konishi M, Kawano N, Kinoshita T, et al. Hepatocellular carcinoma with portal vein tumor thrombus: Embolization of arterioportal shunts. Radiology 1997;204:787-90. Tanaka K, Nakamura S, Numata K, Okazaki H, Endo O, Inoue S, et al. Hepatocellular carcinoma: Treatment with percutaneous ethanol injection and transcatheter arterial embolization. Radiology 1992;185:457-60. Lencioni R, Llovet JM. Modified RECIST (mRECIST) assessment for hepatocellular carcinoma. Semin Liver Dis 2010;30:52-60. Von Roenn JH, Cleeland CS, Gonin R, Hatfield AK, Pandya KJ. Physician attitudes and practice in cancer pain management. A survey from the Eastern Cooperative Oncology Group. Ann Intern Med 1993;119:121-6. Vogelzang RL, Atassi R, Vouche M, Resnick S, Salem R. Ethanol embolotherapy of vascular malformations: Clinical outcomes at a single center. J Vasc Interv Radiol 2014;25:206-13. González-Ojeda A, Cervantes-Guevara G, Chávez-Sánchez M, Dávalos-Cobián C, Ornelas-Cázares S, Macías-Amezcua MD, et al. Platelet count/spleen diameter ratio to predict esophageal varices in Mexican patients with hepatic cirrhosis. World J Gastroenterol 2014;20:2079-84. Seo BR, Min KJ, Cho IJ, Kim SC, Kwon TK. Curcumin significantly enhances dual PI3K/Akt and mTOR inhibitor NVP-BEZ235-induced apoptosis in human renal carcinoma Caki cells through down-regulation of p53-dependent bcl-2 expression and inhibition of mcl-1 protein stability. PLoS One 2014;9:e95588. Huang MS, Lin Q, Jiang ZB, Zhu KS, Guan SH, Li ZR, et al. Comparison of long-term effects between intra-arterially delivered ethanol and gelfoam for the treatment of severe arterioportal shunt in patients with hepatocellular carcinoma. World J Gastroenterol 2004;10:825-9. Liu D, Li HD, Li XF, Lü GR, Ye CP, Li P. Evaluation of TACE combined with RFA and PEI in treating advanced hepatic carcinoma. J Interv Radiol 2009;18:389-91. Thornton RH, Covey A, Madoff DC. Embolic Materials used for Portal Vein Embolization. Venous Embolization of the Liver. London: Springer; 2011. p. 129-36.